Sensitivity to the presence of God reflects a heart full of gratitude and tenderness. 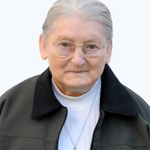 Sister Maria Anilda mirrored humility and simplicity, characteristic virtues of a Sister of Notre Dame. In her life and service, she sang the mercies of God and, in her love and care for her vocation, she proclaimed the divine fidelity. The birth of Anilda brought new joy to the farmers, Olívio and Maria Lydia Corrêa da Silva. They lived in Canela, a town that belonged to Taquara at that time. The couple already had two children and, after Anilda, had eleven more children and adopted four. Being among the oldest children in the family, Sister Maria Anilda helped her parents to care for her younger brothers and sisters. This experience awakened in her the desire to expand her care for many people. In religious life, she found a way to fulfill this desire. 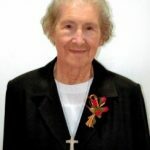 In February 1956, when she was 24 years old, she began her formation for religious life as a postulant of the Sisters of Notre Dame in Passo Fundo. The following year she entered into novitiate. The first years of ministry in the congregation impressed upon Sister the love for nursing. In the second year of novitiate she had the opportunity to be a nursing assistant in a hospital. Later, she attended courses for basic nursing care. For over than 25 years, Sister M. Anilda ministered in hospitals, especially in the pediatric and x-ray departments. People respected and loved Sister. 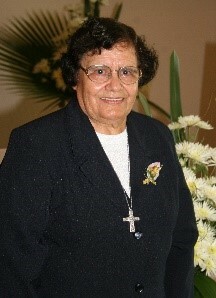 Sister Maria Anilda graciously accepted people´s affection and recognition and returned it in the same way. She had a friendly and kind word for everyone. In recognition for her outstanding services to the hospital and local community, she received the title of Citizen Santiaguense in 1979. Two times she received an Award of Congratulations and Recognition for her services in Ivorá, where she visited patients in their homes. In addition to hospitals, Sister Maria Anilda dedicated her nursing services also in nurseries and schools where she ministered. In 2007, she suffered an accident which brought serious consequences to her health. Even with her physical strength diminished, she engaged in community service. 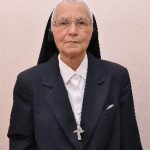 She was responsible to pray the rosary and visit the bedridden sisters in Recanto Aparecida and the elderly ladies in Residence Santa Júlia. 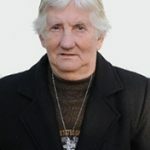 She was very grateful for all help received and thanked with the typical phrase: “I’ll say a rosary for you.” She was a joyful participant in community activities. At the dawn of March 27, silently she went home to the Father. We are grateful for her 60 years of consecrated religious life, her joyful service, and her special presence in community. Saying farewell to our dear Sister Maria Anilda, we ask the good God to welcome her in eternity and that she may intercede for us, our mission, and our Province.